Do Not burn treated timber as Firewood !!! As featured on a recent Radio 4 programme about the firewood log market, it should be remebered that treated timber contains CCA (chromated copper arsenate) and should not be burnt as firewood. CCA is a wood preservative that has been used for timber treatment since the mid 1930's. As the name suggests it is a mixture of chromium, copper and arsenic, it imparts a greenish tint to the timber. It is highly effective as wood preservative, often used as a subsitute for creosote. It protects against fungal decay, wood eating insects and affords a good degree of weather-resistance. Timber is commonly treated with CAA and can be found in fencing, decking and outdoor structures. It is tempting to burn the off-cuts of fencing projects or use the timber as firewood when dismantling outdoor structures and this puts you at risk. There are a number of alternative timber treatments that do not contain arsenic, however unless you can be sure, our advice is to never to burn timber that has had any sort of chemical treatment. 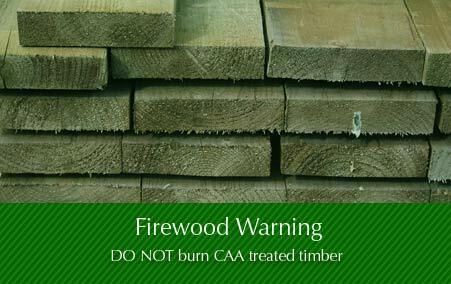 Never burn CCA treated timber as firewood in fireplaces, barbecues, wood stoves or any wood fire. Arsenic in the body accumulates in cells, which over time may lead to skin, bladder, kidney, liver, lung, and prostate cancers. Other forms of arsenic toxicity in humans have been observed in blood, bone marrow, cardiac, central nervous system, gastrointestinal, gonadal, kidney, liver, pancreatic, and skin tissues. However if you do happen to have an approved incinerators, it is an acceptable option. But as the temperatures must be 800°-1100°C.